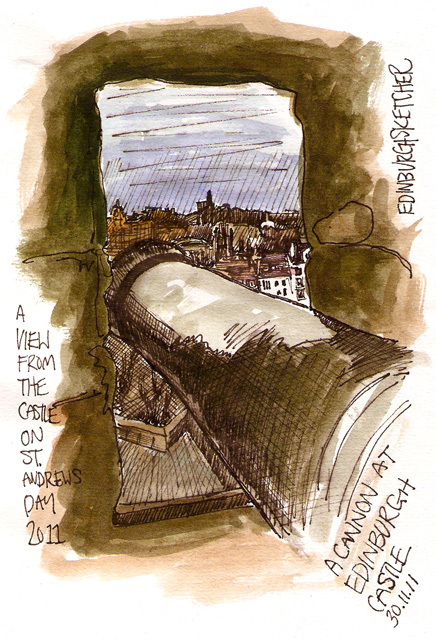 …of one of Edinburgh Castles cannons. Today my wife and I took the twins for their first visit to a very windy Edinburgh Castle, taking advantage of the St Andrews Day free entrance offer. The kids loved looking at the medals, swords and armour on display. But best of all must be the amazing views of Edinburgh and the surrounding countryside from the thick stone walls that once protected the castle from attackers. Like this view towards Calton Hill and Nelson’s Tower. I have again added a little watercolour to give the sketch some life. What do you think?